It fit to make various packing blister, packing container, disposable food containers ...etc production. 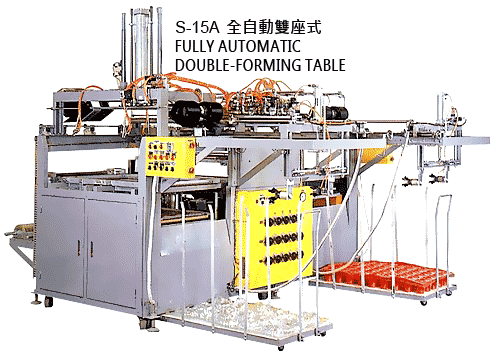 This machine has two stations forming area which could use two different molds with different material at the same machine working at the same time. It has about 2 set of vacuum forming machine output capacity, but only one set of machine power consumption. The power cost will cheaper when use this model of machine. It is a very economic model for customer for power cost saving. It also have various special design for saving the power energy and the lower down wastage material design. PVC, HIPS, PS, OPS, APET, GPET, ABS, PP, PE, ACRYL, PC...etc sheet.